Rosacea Skin Problem is a lot more common than you think. It affects numerous of individuals worldwide. It leaves damages and irritation to the skin. The causes of this autoimmune disease are not verified. Several theories have been formulated, but the cause remains undetermined. Some attribute it to how people suffering from it have facial blood vessels that dilate easily than the norm. The increased blood flow can be apparent on the skin surface, creating a red and flushing appearance. Trigger factors that cause rosacea are numerous. Lifestyle and environmental issues can lead to increased redness. Other people experience acne bumps on the central region of the face. If you are wondering what does rosacea look like on the face, the redness can be seen in different locations, namely nose, cheeks, chin, forehead, and ears. This is the most common and is usually associated with facial redness, flushing, and visible blood vessels. Middle-aged women commonly experience this type. It presents with acne-like breakout on the skin. Possibly rarest of all the rosacea skin problems. It thickens the skin of the nose and commonly presents with another subtype of rosacea. The condition is more common in men than women. As the name implies, the symptoms are apparent in the eye area. Unfortunately, rosacea is incurable. There is no known way on how to get rid of rosacea permanently. Prevention and proper management of symptoms are your best bet. Thankfully, something as simple as the application of essential oil for rosacea is known to reduce its symptoms. It is one of the few natural remedies that can alleviate the discomfort and pain that go with rosacea. What Are The Best Oils For Rosacea? The oil comes from the flowerhead through steam distillation. The oil has strong moisturizing abilities and has antiseptic and antifungal properties, as well. When applied, the oil can reduce the redness and itching brought about by inflammation. This oil is a classic for a reason. Aromatherapy and beauty products have lavender oil as their primary ingredient for centuries now. The oil is very mild that it can actually be applied directly to the skin without any dilution. Of all the known essential oils that can help the condition, Lavender should always be included in the best skincare for rosacea skin. Most dermatologists when asked regarding what is the best oil for skin and hair for them, often recommend the use of jojoba oil. The structure of this oil is quite similar to that of the sebum, the natural found in the skin and the scalp. Fortunately, unlike sebum, it is non-comedogenic. Tea tree oil is always included as ingredients in different skin care program. Tea tree oil has strong anti-inflammatory and antiseptic properties. One of the best ways to get rid of rosacea is by using tea tree oil in any medium such as lotion, cream, mask, or mist. If you are experiencing rosacea subtype 2, you do not have to look further for acne treatment that works fast. Geranium oil is a good way to heal a lot of skin disorders such as rosacea, dermatitis, and eczema. A mixture of 6 drops of Geranium oil and one teaspoon of coconut oil. Put it in a bottle and use as a facial wash. You can use it every day when necessary. Coconut oil has various health benefits. The food and cosmetic industry have a lot to say about the contributions coconut oil have. It moisturizes the skin and speeds up wound healing while reducing inflammation. Coconut oil can be used as is. Just take the right amount and massage gently on the face at night. With a cotton pad, remove the excess oil. Anti-inflammatory with anti-aging properties? Yes, please! In the event of a deficiency of skin lipids, borage essential oil can help fix the problem and keep the epidermis healthy and moisturized. 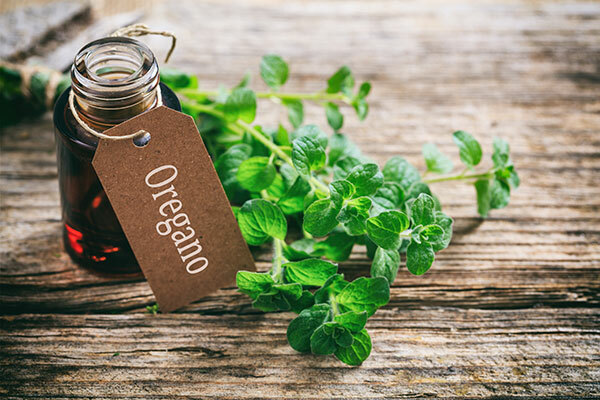 Oregano is a great substitute for antibiotics and steroids. This is why the oil is an answer to the question “What are the best moisturizers for sensitive skin?”. Oregano Oil can keep rosacea symptoms at bay without aggravating it. Fight external factors that cause uneven texture, tone, and pigmented skin. Sunlight is considered a possible culprit in rosacea development and can cause skin discoloration and unsightly age spots. In just a few drops of rosehip oil, you can kiss these skin problems goodbye. If rosacea is caused by eczema or other complicated illnesses, primrose oil can treat the redness and inflammation. This is one of the few natural oils that can address swelling of the skin tissue located at the nose, cheeks, and eyes. It is also a well-known bactericidal. Simply mix the following on a spray bottle: 2 drops of German Chamomile oil, 2 drops of Lavender oil, 2 drops of Rose oil, 4 ounces of purified water. Et voila! You got a skin mist to spray on your face, an effective treatment for rosacea. This can be used day and night. Mix one jar of 2 teaspoons of Jojoba oil, 1 drop of German Chamomile, and one-fourth teaspoon of Aloe vera in a jar. This can be applied three times a day to reduce redness. Mix 5 drops of Lavender essential oil, 5 drops of Tea tree oil, 8 drops of Oregano oil. An ounce of Apple cider vinegar, and two ounces of Aloe vera gel in a bowl. Place on a bottle. Always shake before use. Mix ½ cup of Aloe Vera gel, 1 tbsp of lavender hydrosol, and 1 tbsp of German chamomile hydrosol ins bowl. Add in 3 drops of lavender essential oil, 2 drops of German chamomile essential oil, 1 drop of vetiver essential oil, one tbsp of rosehip seed oil and stir. Place in a container and keep in a refrigerator. Shake well before using twice a day on affected areas. Related: 9 Foods That Cause Skin Inflammation. Know How To Deal With It! 2. Eat right. Avoid yeast, dairy products, sweet food, and fried foods as much as you can. Identify trigger factors in your diet. 3. Relax. Managing your stress levels is important to avoid rosacea. Remember, prevention is better than cure. It is a lot easier to stay clear of an attack than to manage the symptoms. This is true of any diseases or conditions. So, there you have it—everything you need to know on how to use essentials on in treating and managing rosacea. Hope this information helps!